Mei Lin Yap takes the opportunity in her latest Frontline contribution to detail her likely doorstep questions for politicians in the upcoming General Election in early 2016. If a politician called to your door, what would you say to them? My name is Mei Lin Yap and I am a young woman with Down Syndrome. I WANT TO BE A CITIZEN, JUST LIKE ANY OTHER!! I would like to be treated like any other citizen; I feel people with disabilities are not respected, valued, by our society. Are you prepared to ensure equal access to education and employment for people with disabilities? People with disabilities need equal access to education and employment. They can bring a range of skills, talents and abilities to the workplace. When I look in the mirror I forget that I have a disability. Everyone should feel valued in society. We need a voice. NO MORE PROMISES. THE TIME IS NOW!! Why has the government not ratified the UN Convention on Rights for People with Disabilities? The Irish government agreed The Convention of Human Rights of People with Disabilities in 2008, but have not yet ratified it. This is needed to protect our rights in law. We all should be valued by society. Everyone in the world deserves to be treated fairly and equally. People with disabilities need equal access to education and employment. They can bring a range of skills, talents and abilities to the workplace. However, support for both employers and employees with disabilities is essential if employment opportunities are to be successful. When I look in the mirror I forget that I have a disability. Even though I am aware that I have Down Syndrome, and that affects my understanding, I know I have a lot to offer. I want equal access to education, employment and healthcare. Everyone should feel valued in society. We need a voice. We don’t all need others to make decisions for us, but we may need support in making our own decisions. NO MORE PROMISES. THE TIME IS NOW!! 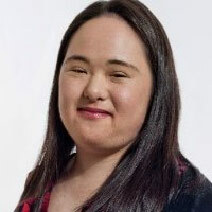 Mei Lin Yap is a regular contributor to Frontline Magazine Ireland, with a keen interest in the rights of people with disabilities, particularly with regard to access to education and employment.